With so many new players added to the Colorado Rapids this season, it was a familiar face that had the most impactful performance on a windy night in Commerce City. The Rapids drew with Sporting Kansas City 2-2 in their home opener in front of a sellout crowd. The Rapids, playing their first regular-season game, faced off against Sporting KC, who had already played three games and went 2-1 during the stretch, putting them atop the leaderboard in the Western Conference of the MLS. The Rapids exploded out the gate, jumping out to a two-goal lead within the first 10 minutes of the contest. After an impressive start, the Rapids sat back and relaxed while Sporting Kansas City attacked with a vengeance. Sporting KC scored both of their goals in the second half, the second one coming in injury time. On paper, the Rapids were dominated and should have lost the game. Sporting Kansas City had the upper hand in nearly every statistical category including total shots (20-8), shots on target (9-2), corners (7-0), crosses (21-5), possession (62%-38%) and duels won (62-55). 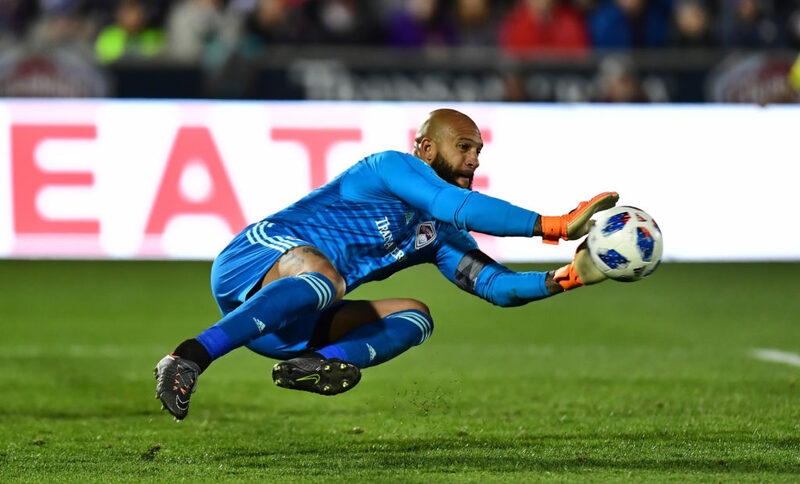 While Colorado statistically should have lost, they managed to gain one point thanks to the performance of Tim Howard, Rapids goalkeeper since 2016. Howard, who has been playing professionally since 1997, has solidified himself as one of the greatest American soccer players of all time. Like a fine wine, his play has only improved with age. Howard finished the night with seven saves, singlehandedly keeping the Rapids in the contest. Players and head coach Anthony Hudson praised his performance after the match. An incredible moment occurred postgame. Edgar Castillo, man of the match, didn’t let Howard’s performance go unnoticed. Castillo, who prefers speaking Spanish to English, was asked about Howard and his performance in the second half. Halfway through the translation of the question, he cut off the translator, proclaiming the performance and breaking the language barrier, revealing the importance of Howard and his overall presence. For the man of the match and an assist man to commend the play of his goalkeeper speaks volumes about his value to the team. Tommy Smith, who also had an assist on another goal, explained that Howard was the reason Colorado gained a crucial point last night. The Colorado Rapids made 14 roster changes for this season, and many new players made immediate impacts for the club. Mason, a transfer from Wolverhampton, scored 10 minutes into his MLS debut. Castillo, a loan transfer from Liga MX, produced an assist in first MLS regular season game. While these are impressive feats that helped Colorado gain one point in the Western Conference, the gained point would not have been possible without Howard. The Rapids will rely on Howard throughout the season and will hope for more otherworldly performances like his performance last night. Howard’s next chance to turn heads is next Saturday at home against the Philadelphia Union.